Colorado has two statewide transportation-related initiatives on the ballot next month. Has anyone analyzed these to see what projects might come around? I've seen some items in the media about a US 287 bypass at Lamar, widening US 85 to an expressway between C-470 and I-25 in Castle Rock, and making improvements to a variety of freeways. 109 is a bond measure (floating $3.5 billion in bonds) on certain road projects throughout the state, with an estimated repayment amount of $5.2 billion or so. The sate legislature will be obligated to repay the bonds over a 20 year period out of the state's budget without there being a dedicated revenue stream. It's the brainchild of the Independence Institute, a local right-wing think tank. 110 is also a bond measure ($6 billion in bonds) that will also establish a citizen oversight committee, that will be repaid by a .62% increase in the state sales tax over a 20-year period. It's a measure that has broad bipartisan support. I may be obvious that I have a bias here, as I think the next time the Independence Institute comes up with a good idea will be the first time. CDOT set up some pages on their site with the projects that might get a boost from 110; the main wishlist is here, and there’s a map view linked off to the side; there's some interesting candidates there. 109 comes with a hardcoded list of projects (based on some earlier CDOT list, I think) to apply the ≤$3.5 billion on, but CDOT’s estimating that they’d cost over $5.6 billion total; there’s a copy not the list in here. In freeway projects, a few items on both lists are continuing the I-25 North express lanes (Hwy 56 to Hwy 402 is up next, I think, carrying on the eternal I-25 North construction season), modifications to I-25 from US 36/I-270 to 88th Ave (that one’s interesting for being one of the few new proposals for GPLs, albeit short ones), and extending the third lanes on I-25 south of the Springs to Mesa Ridge Pkwy. I-70 in the mountains has a few entries, too. Going off the two Andy mentioned, the first pass at the Lamar Reliever Route is there as a two-lane road with interchanges to the north and east. The southern interchange is out, but I’m not sure if that’s forever or just until the hypothetical expansion to four lanes There's a low-res graphic of the project here (resembling the stuff from this in 2016); it's a bit different from the interim setup that would've come with the original study (final configuration here). Looks like widening 270 is on both lists; thank goodness. I would think that if they were considering 4-laning US 85 down to Castle Rock, they would have configured US 85 with 4 lanes when they constructed the interchange with N Meadows Dr/Castle Rock Pkwy. Right now, US 85 is two lanes thru there and 4 lanes about a half mile south of there, at Promenade Pkwy. But good to see that widening 270 is on both lists. I think reconfiguring the C-470/US 285/Morrison Rd interchanges is much-needed. It was needed a decade ago when I lived out there, and I'm reminded every time I try to go to a concert at Red Rocks (since I come from NB C-470). What I found interesting was the interchange by the Taj Mahal (JeffCo complex), at US 6 & Heritage. It looks like CDOT is (slowly) upgrading the western bypass of Denver in fits & spurts. It was only a year or two ago that they completed the interchange at 19th St in Golden. Yeah, you're probably right about 85. I think I had this in mind, but was thinking that the PEL section went further. Something kind of interesting, but probably just an oversight, is that while most of the ballot project materials reference Daniels Park Rd as the end point, there are a few places that use Meadows Pkwy instead. I’m looking forward to any new developments on the 6th/Heritage interchange—for the eventual traffic help, but also just to see what sort of designs they come up with. The 19th St interchange has been great in a car and for walking (both over the highway and at Elm St); there’s probably not as much to get creative with around Heritage as far as transportation dynamics go, but maybe something interesting’ll come up. Going on a tangent from there, Golden and CDOT have a fairly nice future planned for US 6 and Hwy 93 in the city limits (MOU/graphic)—limited access four lanes (allowing for more, probably tolled, past a traffic threshold), but with highway-concealing treatments near cross streets with ‘stuff.’ It’s sort of disappointing that the speed limits will remain at 45 and 55 since they’re usually ignored anyway, but the deal technically allows them to change under certain conditions. The plans north of the city aren’t as interesting, but they actually exist as of earlier this year after the WestConnect study, so I guess that’s something. Also on the would-be beltway path, the Jefferson Parkway group has been inching toward getting a "private partner" and is taking qualifications now; something may actually end up coming out of that after all. It seems that Golden/CDOT are pretty roundabout crazy, with all the interchanges but the US 6/SO 58/CO 93 interchange getting the roundabout treatment. As for the 6/58/93 interchange, it surprises me (a little) that they're thinking a diamond there, with 6/93 the through route (without a direct ramp to continue WB on US 6). I have a feeling that the offramp from WB 6 to continue heading west might see a backup on some weekends. With the CO 58 freeway ending just about a quarter mile east of the current intersection, I would think that they could plan for most of the movements to be done as a stack (or stack with cloverleafs) interchange, with the 58 freeway ending at the interchange. I know the terrain is somewhat limiting but not, IMO, prohibitively so. [...]Going on a tangent from there, Golden and CDOT have a fairly nice future planned for US 6 and Hwy 93 in the city limits (MOU/graphic)—limited access four lanes (allowing for more, probably tolled, past a traffic threshold), but with highway-concealing treatments near cross streets with ‘stuff.’ It’s sort of disappointing that the speed limits will remain at 45 and 55 since they’re usually ignored anyway, but the deal technically allows them to change under certain conditions. The plans north of the city aren’t as interesting, but they actually exist as of earlier this year after the WestConnect study, so I guess that’s something. Golden sure is into roundabouts; admittedly, I like that about them. I’m hoping the 6th/Heritage interchange work will reach down to Golden Ridge Rd and stick a roundabout there, sort of like the ones on S Golden Rd. Something to better work with (or maybe remove a few of) the outside lanes—those to the south especially aren't really helpful. I suppose that's not really a big deal overall, though. I agree that they could get a more free-flowing interchange configuration at Hwy 58; with traffic on 58 so light for a freeway, they might not care to try it for the cost, and perhaps the potential to upset the city (with taller structures in the case of a stack). With the “Golden Plan” graphic being a pretty high-level plan as far as interchange designs go, though—before the 19th St project, its looked about the same as Heritage’s in the document—something to make the more common turns easier might come up. I could see them doing a DDI or something CFI-y there; CDOT’s been really into those lately. C-470 and US 85’s getting a crossover instead of a northbound to westbound flyover (and 85 a bunch of CFIs instead of interchanges south of there, at least for the foreseeable future), and DDIs are the frontrunners, replacing hypothetical single-loop interchanges, for Powers Blvd/Research Pkwy and I-70/Picadilly Rd. On that last one, since I'm not sure if it's been posted (lately?) and it's an interesting one to look at, the Picadilly interchange would be part of the "I-70/E-470 Interchange Complex," eventually featuring a free-flow interchange between the freeways and probably some manner of disconnecting Colfax from I-70 (but maybe less with the DDI?). Neither 109 nor 110 passed. Status quo. Yeah, both failed pretty hard. The status of the badly needed 270 widening now comes into question. The proponents of both measures simply couldn't demonstrate the need for the bonds/taxes. And let's be frank: When both the cut-and-cover trenching of I-70 thru Globeville AND the widening of I-25 from Castle Rock thru Monument were able to locate financing and start construction this fall, it made passing 109 and/or 110 that much harder. The first ads I saw for 110 made it seem like tourists were paying for it, then when it came to light that everyone would pay for it (through higher fuel taxes), it's possible that some soured on it, feeling they were misled. I know that I had some qualms about that. However, I also drive in Colorado. I know that there are a lot more roads in bad shape than just I-70 and I-25 in DougCo. I-270 keeps getting brought up here for a reason. So I voted for 110, and against 109. Hell, I'm now going to be a vocal proponent of widening US 6 thru Clear Creek Canyon so that drivers don't have turn a corner and have a split-second to choose between running over a rock in the center of the lane, swerving into oncoming traffic, or slamming their brakes (and risking being rear-ended). That is the choice I was faced with last Friday. Yes, I know, Central City Parkway, blah blah blah. I wasn't going to Central City. I was going to Black Hawk. And it was really windy, and probably snowing at the higher elevations. And yes, I'm bitter now. Oh boy! More Lexus lanes! There was an open house for the C-470 Express Lanes project last week. They uploaded the presentation here; it has some graphics of the new westbound ramps around the I-25 interchange and the particulars of the express lane entrances and exits. I’m not much of a fan of the westbound toll lane becomes the left GPL once it ends (the right lane exits to Wadsworth). The separate ingress/egress style and is new for Colorado, I think, although if I remember correctly, the I-70 project will do that sort of thing, too. There’s also a meeting coming up for [unfunded] planning for US 85 between I-76 and E-470, but they posted the high-level idea: interchanges at 104th and 120th, removing access to 124th and Long’s Peak Dr, and a signal at 112th. The signal’s kind of weird since this stretch of 85 is one of the few highways in the state that CDOT plans designate as freeways. (It’d be a freeway up to Ft. Lupton, then an “enhanced expressway” up to Platteville.) Since this is forming plans without money to build anything, I’ll be curious to see if they explain not going all-out with 112th, too. In Powers Blvd stuff I missed before, work on the portion from I-25 to Voyager could allegedly start in three to six months (here); anything that says they’re going to start work feels overly optimistic, but if they keep saying it’s some months out, eventually it could be true. The developer has a vested interest, at any rate. There was also a little discussion of the Powers/Research interchange not happening here; diverging diamond expected there. The original plan was to have a loop in the northwest corner, which is perhaps why the at-grade intersection wasn’t built off-ramp style like the others in the extension north of Woodmen. I'm not seeing a good reason so far for keeping 112th as a signalized intersection - this intersection may/will probably have the same safety issues cited for the 104th and 120th intersections. The rear end crashes might even increase once the 104th and 120th interchanges are completed. With growth around Denver, it also seems to me the enhanced expressway ought to go all the way to Greeley. Leaving the signal at 112th makes the two interchanges pretty pointless IMO. I use that short stretch of 85 between 104th and 124th all the time when working; the lights just kill the flow so I can't imagine why you'd go to the great expense of building two full interchanges and then leave a signal between them.... I shake my head. Late on catching up on Colorado topics, and I wondered why I missed the story that work on the extension of Powers (CO-21) to I-25 could begin soon, especially because it was carried on the station I usually watch for local news (KOAA-5). I was on vacation when that story ran. I'm sorry that 110 failed, but you can't expect Colorado drivers to ultimately conclude they need to actually pay for road improvements. I just can't get over the whining about the I-25 Monument to Castle Rock project building an express toll lane - where do people think the money for the improvement is going to come from? I may well end up with an Express Toll transponder on my windshield by 2022. I believe there is a segment of Colorado "natives" that will vote against every tax/fee proposal that would expand road/transportation capacity in the hope that it will stop the "Californication" of Colorado. Never mind that most of the added population is from states to our east/southeast (I'm looking at YOU, Texas). Indeed, my stepsister moved to the Denver area from TN, but she’s been there for nearly 20 years now so she pretty much considers herself a local at this point. Meanwhile all of the Californians are actually moving to the southeast, especially Nashville, Atlanta, and Charlotte. Some recent news on a few road projects that mostly live in the background. In Colorado Springs, the Copper Ridge Metropolitan District (accumulating money for the Powers Blvd extension through an urban renewal area) gave a presentation with a status update and to request a larger portion of the URA’s sales tax. The slides are here; audio is available, but it’s very hard to hear the speakers, so I’m not totally sure what they went over verbally. A couple interesting points scope-wise: all the images show the northbound Powers to southbound I-25 ramp, which—at least for a while—had been excluded from the initial interchange project, and the phase 2 slide says the Interquest/Hwy 83 interchange, which some past updates indicated would be left to CDOT, would be included in the project. The Jefferson Parkway also came up in the news; the JPPHA needs one more piece of land after they redesigned the Hwy 72 interchange again, and the owner isn't happy about another change of plans (article here, follow-up here). They were originally planning a diamond interchange with a realigned Hwy 72 (sort of visible in their right-of-way map and in some older general designs), but were thinking of a folded diamond in mid-2017 (see state highway intersections here). By early 2018, they’d unfolded the northbound ramps (see plans here). Working with the Federal Aviation Administration (FAA) has been challenging, so the JPPHA Board has suggested that a different alternative that serves the purpose should be explored. 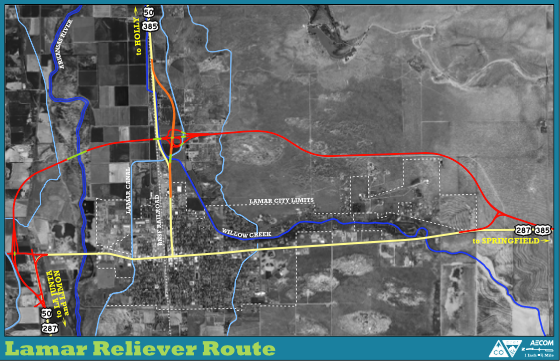 Bill ray has approached the Colorado Department of Transportation (CDOT) and discussed shifting the north end of the Parkway from where it was going to be (across from Interlocken) half a mile to the west. CDOT has agreed to this realignment. JPPHA will modify their access permits to a slow for this change. It would be possible to add lanes onto State Highway 128 to accommodate traffic, and CDOT has agreed to that approach. So it looks like at-grade intersections at either end (CO 93 & CO 128/Interlocken Loop) with no plans to extend the controlled-access section to the current end of Northwest Pkwy. Yeah. It seems like there’s some interest on the side of the Northwest Parkway people, though, to build some kind of connection to the Jefferson Parkway, but it’s hard to tell around their general reticence. They were apparently interested in building an extension as well as the Jefferson Parkway itself, but their unsolicited proposal for the JP portion was rejected. Two of three members of the “Jefferson Beltway Connection Partners” JP proposal team are NWP stakeholders (public info doc), so a similar version of that idea might come up again if that team gets the project. Hwy 93 (Jeff. Pkwy to Golden north city limits): not going to be a freeway, but there’s an outside chance of it being expanded to four lanes if funds materialize. With channelized-T intersections, southbound would be free-flowing. Hwys 93 & 6 (Golden north city limits to C-470): “freeway” and “beltway” are dirty words here, but Golden’s MOU with CDOT cleared the way for a limited-access 45- (north of 19th) and 55- (south of 19th) road. Heritage Rd is up next for an interchange; without outside help, the city/county plan to put some money toward design in a few years, I think. Is there any thought of grade separation at the 58th and 64th Avenue intersections? Grade separations have not been deemed warranted given traffic forecasts within the 20-year planning horizon of the PEL analysis. In Alternative 2, Southbound traffic would not have to stop under the Channelize T intersection improvement option. Some updates on the I-25 “Colorado Springs Denver South Connection” PEL, which was previously put on hold to run the EA for the Monument/Castle Rock HOT lanes; CDOT posted the boards from their Jan 15 meeting here. Something else I find intriguing is that they included converting GPLs to managed lanes in their evaluation, which also came up in the I-25 Central PEL. I don’t think Colorado is part of any programs allowing that—I haven’t thoroughly looked—but it’s interesting to see the idea’s in mind. I imagine present-day CDOT regrets not using any managed lanes north of Castle Rock, but the idea was rejected on the grounds of “implementation issues and community values,” which now sounds ludicrous. CDOT also got around to posting a fact sheet for the Powers/Research interchange (sheet, site); no great new insights, but as reported to the city, the preference is a DDI, and they say it’ll be larger than the one at I-25 & Fillmore, which is promising. I don’t know if they’ve done any meetings about this, which is slightly unusual (maybe it's because they’re technically re-evaluating an older study), but it’s sort of a nice change of pace for them just to say “this is the type of interchange” instead of dancing around it for months. No timeframe for anything beyond design at this point.